FLAGGING TAPE - SINGLE ROLLS - We are selling off our single rolls of flagging tape for 1/2 off regular price (12-roll cartons are still available). 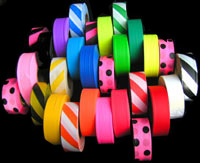 Identi-Tape has UV resistant flagging tape in 14 solid colors and 14 patterns. Flagging tape is used for surveying, search and rescue, access & trail marking, forestry, environmental studies, and triage. "Glow" colors fluoresce when exposed to black-light (UV). Striped flagging is shown below. For 12-roll cartons, see Flagging Cartons. Note: Flagging tape has no adhesive and does not stick or adhere.